James Miller (6 years ago) Inappropriate? These have been a big help in my work. Thank you!!! 3dstories (6 years ago) Inappropriate? I'm finding that I use the Lorenzo LoRez characters much more than I thought I would. These add-ons are great! Keep them coming! I really wish I could do what you do. Thank you. Awesome! I'm surprise you don't have more raters for such a cool product! Thanks for the update to it too! Varsel (8 years ago) Inappropriate? I'm sorry but at the moment there are no plans for making any of my uniforms in Hi-rez. Boggy49 (8 years ago) Inappropriate? How about make your outfit to fit Micheal 3 and 4 and Apollo and make them Hi-res? Nice work anyway. Even more nice stuff, thanks a lot! Oh, man! This is wonderful! So pleased to see this. 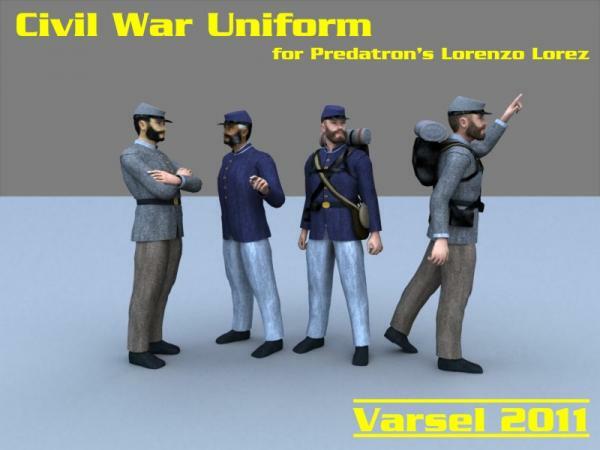 Now could you continue the Civil War stuff with Officers' uniforms and calvary ones? Thanks so much!